I first fell in love with the work of 600 Highwaymen a few years ago in Austin, where they performed This Great Country—an experimental version of Arthur Miller’s Death of a Salesman featuring a cast of 17 ranging in age from twelve to 80—at the Fusebox Festival in 2012. I’ve followed their work closely since, and while some pieces were better (The Record) than others (Everyone Was Chanting Your Name), they’ve consistently challenged themselves, offering results that both surprise and charm. I missed Employee of the Year when it had its NYC premiere as part of Crossing the Line in 2014, and was excited at the chance to make up for that when it was announced as part of the 2016 Under the Radar Festival. It did not disappoint. 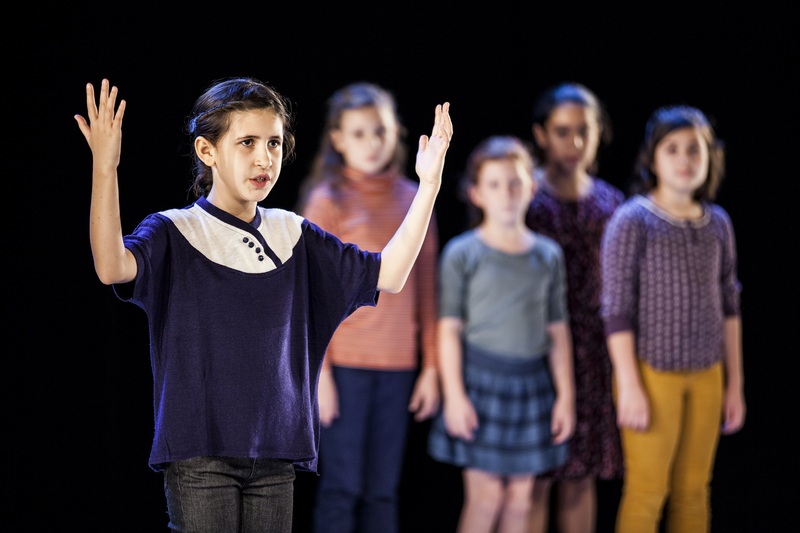 The concept of the piece is fairly simple: Five young women—who were in their ‘tweens when the piece was developed, I believe, though today they appear to be early teens—take turns performing a long monologue from the perspective of a woman named J. Her story begins in her childhood, and quickly accelerates to the tragedy that defines the rest of her life. In her late teens, after going out with her boyfriend one night, she returns home to discover her house has burned down and her mother (or, as she’s soon to discover, the woman she thought was her mother) dead. She’s quickly sent off to friends of her adoptive mother, where she begins a long (a lifetime’s worth) journey to find her own mother, which takes her from Boulder to Chicago across the course of six decades. While the narrative recounted is rich and affecting in its own right, it’s only one small piece of what 600 Highwaymen are doing with this show. The design is minimal: a large square of carpet at center stage. As in past pieces, there’s a choreography of sorts that consists largely of abstract poses. While these may occasionally have a figurative or metaphorical significance, in practice they present a challenge the purpose of which is to reveal something about the performer. Unlike in a conventional dance, the choreography is not designed such that it is smoothly and flawlessly performed. Rather, these poses represent a static architectural challenge the performers must move in and out of. Lacking in conventional dance training (or, perhaps, discouraged to employ such), this process begins to showcase the specific way each performer moves. This was essentially the sum total of The Record, still the company’s most beloved piece, a nearly hour-long movement performance featuring 30-some non-conventional movement artists. In Employee of the Year, this tactic of presenting a performative gesture as a task to be completed is expanded to music. David Cale provides a series of witty and melodic tunes these young women perform a cappella. It’s not an insult to their abilities as singers to point out these young women lack the sort of polish a musical theater actor would bring to a performance. That’s the point: Instead of letting these moments of musical performance collapse into a well constructed performance where the focus is squarely on the emotional and lyrical content, here we’re kept aware of the distinct qualities of voice—the warbling sustain or the pitching note. We’re made explicitly aware of the performer as an individual, different and distinct from anyone else. The effect is quite remarkable. There’s a relationship between what Michael Silverstone and Abigail Browde—the creative duo behind 600 Highwaymen—are doing and the biographical works of Jérôme Bel, in pieces like Cédric Andrieux or Disabled Theater. Bel treats his subjects almost as an ethnographic study. Although the stories they tell are their own, they’re often limited to recounting mundane details of whatever they’ve done to be “worthy” of talking about it onstage. There’s no literary attempt to represent the sum total of their experience in text. Rather, their presence onstage is always at odds with that reductive, confessional tendency. Bel’s structure is intended to ensure we’re always aware that these individuals are more complicated and complex than what we’re being given. The full richness of identity isn’t presented as the subject of the show, but rather it’s always peeking around the corners, hinted at and showcased by the work’s inability to fully convince, to permit the theatrical collapse of the performer into a character within a fiction that will compel us. 600 Highwaymen are doing something similar, but whereas Bel’s work is inherently biographical, theirs is not. Rather, that complexity and difference inherent in the performers’ physical beings is the condition they aspire to in performance. In conversation, Michael and Abby have always shied away from the idea that their work is somehow a form of social practice or making use of “non-actors” to perform. Rather, they credit those who take part in their pieces as actors every bit as deserving of that recognition as anyone in a Broadway show. But they reverse the logic by which we credit actors for their skills. Prior to writing this, for instance, I found myself reading numerous remembrances of the British actor Alan Rickman, many of which focus on his voice for which he was well known. No one can deny Rickman was a fine actor, but whereas he receives credit for how well the particular combination of appearance, voice, actorly smarts, and presence he brought to a role served the role’s purposes, Michael and Abby seem to accept that these constituent parts can have value in their own right, regardless of whether they’re as distinctive in combination as what Rickman delivered. Treated right, one doesn’t have to be as inherently compelling in a role as Rickman was for the particulars of how your voice sounds, how you move onstage, how you express or deal with emotionally fraught material, to be compelling and moving in your own right. The work 600 Highwaymen does is beautiful and moving and maybe, in some crucial or understated way, a democratic enterprise that asks us all to consider the unique beauty of one another. Which is a hell of a thing for a play featuring five rather young women to leave you thinking about when you leave a theater.